If you are a licensed driver, you already know the rules of the road in your own state. While many of those laws are the same from one state to the next, there are some states that slightly have different rules drivers are required to follow as well. If you are planning to move to or visit New York, you need to be aware of the following rules of the road that may be different from those you are used to following. Those who move to New York are required to turn in an out-of-state license and obtain a New York license within 30 days of becoming a resident. The legal age to drive in the state is 16 years old. Drivers who are younger than 16 but have an out-of-state license are not permitted to drive on New York streets. The first step in obtaining a license is to have a learner’s permit that allows driving with someone who is 21 or over and has a license. 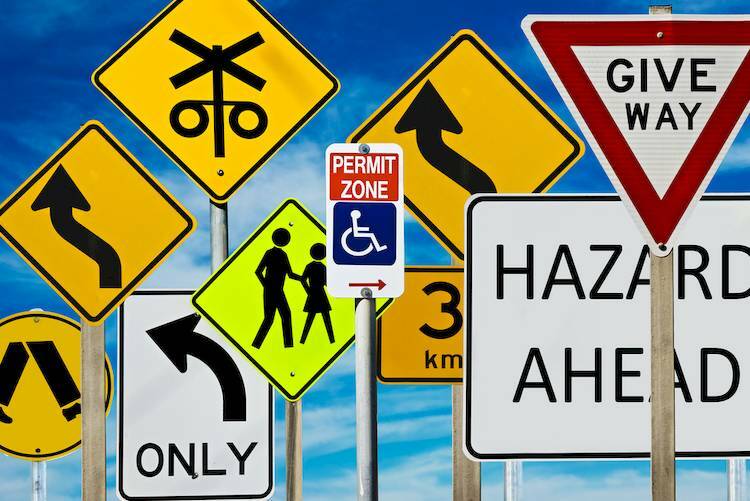 Permit holders must also take an approved driver’s education course, complete 50 hours of supervised driving and hold the permit for six months. A junior license is available after satisfying all requirements and passing the road test. A senior license is available for those who are 17 and older. If you have a junior license, you will automatically receive a senior license when you reach the age of 18. Drivers must yield right of way any time another motorist or a pedestrian presents a hazard that could lead to an accident. Drivers are required to yield to pedestrians in both marked and unmarked crosswalks. Motorists who have the right of way, such as at a green light, can’t enter the intersection if there is a traffic backup that may prevent them from making it through the light before it turns red. The driver and all front seat passengers are required to wear seat belts. Drivers and passengers in the front seat without a seat belt can be cause for being pulled over and each person over 16 years of age will be fined. When the driver holds a permit or junior license, every occupant must be buckled, regardless of seating position. Children under four must be in a safety seat that is anchored to the vehicle using either the LATCH system or a seat belt. Children weighing over 40 pounds and up to the age of 6 must be in a booster seat. Children weighing over 100 pounds can be in a seat belt with a shoulder and lap belt. Insurance - All motorists are required to have insurance on all registered vehicles. If insurance is cancelled or has expired, drivers are required to return the registration and license plates to a New York motor vehicle office. Failing to do so for a period of 90 days will result in the suspension of your driver’s license. Inspections - All vehicles driven in New York must undergo an inspection within 30 days of purchase or transfer. Vehicles not purchased from a New York State dealer must be inspected within 10 days. Turn signals - Drivers must use a turn signal 100 feet before they intend to make the turn. If the vehicle turn signals do not work, the motorist must use the appropriate hand signals. Passing - It is illegal to go over the posted speed limit when passing another vehicle. When on the highway, drivers of vehicles who are being passed frequently on the right are required to move to the right lane when it is safe to do so to allow the vehicles to pass using the left lane. School buses - All drivers are required to stop when a school bus has its lights flashing and is loading or unloading children. This applies even to those who are on the opposite side of a divided highway. Bridges - Drivers are not permitted to park a vehicle on any bridge in New York. Emergency vehicles - Drivers must move over when an emergency vehicle is parked on the side of the road with lights flashing if it is safe to do so. Additionally, all drivers are required to slow down and prepare to stop if necessary. Speed limits - If no speed limit is posted, the maximum speed permitted is 55 mph. Following - Drivers are required to follow the two-second rule when following another vehicle. If traffic is heavy or weather conditions are not optimal, this space must be increased for safety. The above rules, along with those that are the same in all states, must be followed when driving in New York. If you would like additional information, please reference the New York State Department of Motor Vehicles brochure.